Home ParentingRaising BoysOscar	Who knew Diapers could be so much Fun? Cloth diapers that is! When I was pregnant I thought I would try my hand at cloth diapering, but had NO idea where to begin. Luckily, I had several friends who were doing it so I had a lot of help. We got several different kinds and decided that when we found something we liked we would sell the others and stock up. Well, of course having a baby changes everything about your plans and our journey with cloth got off to a rocky start. For a while, Oscar couldn’t nap in them because he would always wake up early and need to be changed, which in turn ended the nap. When you have a newborn and they are napping 4 times a day, there is pretty much no other time, so cloth was out. Also, since we had several different kinds and weren’t using them every day, it took me a while to figure out what worked best for us. Thankfully, I powered through and I can now say that we are committed to cloth! We still use a disposable overnight because Oscar is a heavy wetter (can you say SIZE 4 overnights???) but during the day he is almost always in cloth and I love it. 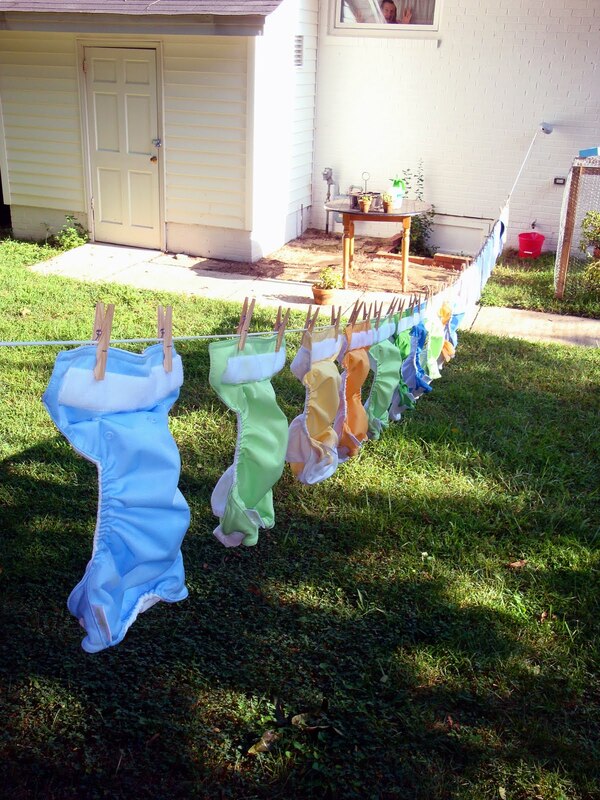 I have my system down for washing and this weekend we finally picked up a clothesline so I can hang them to dry! This prolongs the life of the diapers and helps keep them from leaking due to the dryer breaking down the material. We decided to primarily use pocket diapers, more specifically BumGenius. They work great and are the easiest for me and Jerry, plus they fit Oscar really well. Cloth diapers are just like anything else in that different brands will fit differently on different babies. Geez can I find another way to use the word different? Cloth can be pricey initially, but after only a couple months of buying disposable after disposable, I definitely think it is worth it. Plus, you can get them secondhand online at places like DiaperSwappers and honestly, it’s no big deal. I was so grossed out by the thought of buying secondhand until I used my own for a while and realized that each diaper we used was only even tried once or twice when we chose to sell it. I made back most of what I paid and was able to fund the new BGs. Score! Besides, who can resist this?? I used cloth diapers on all 3 girls. I washed and hung to dry just like you. It really saved a lot of money. don felt sorry for me and hired a diaper service for a year with Kelley. My girls couldn't wear disposable ones after that. For my heavy nighttime wetter, I used a gdiaper flushable insert inside my bG's. It worked soo well! And the best part was being able to flush the insert after. gdiapers.com You can buy a package of inserts on diapers.com. With two in diapers, I have to admit that it has been really tough to keep up with the laundry, and we have big gaps in our cd use. But they are still my favorite…So cute and comfy. My boys prefer them 100%! I LOVE cloth because they are so cute! I have to admit, the BG's don't come in enough patterns for me, with just the solid colors. I love Happy Heinies and Wahmies for those. We do BG's at night though, with THREE inserts! I use the regular and the doubler, plus an extra either doubler or some other insert like Hemp Babies. Otherwise, like Oscar, he pees through it. LOL, love the Jerry cameo! Popped over here from 30Threads. I've used cloth diapers with all three of my boys, and love them. Besides the environmental factor, they are just so cute! I am a cloth diaperin' mama too! I love it and enjoy making them as well. We use cloth too and LOVE them. Sadly, BumG 3.0 weren't yet around when Linus was born so we have a gDiaper/prefold system. But it works and we love it. I try to get everyone I know to use cloth. I show them how easy it can be and am always sure to show them pics of babies in cloth diapers b/c they ALWAYS look so much cuter. PS- Do you have a diaper sprayer? It is the best thing ever and a must as babes eat more and more solid foods.